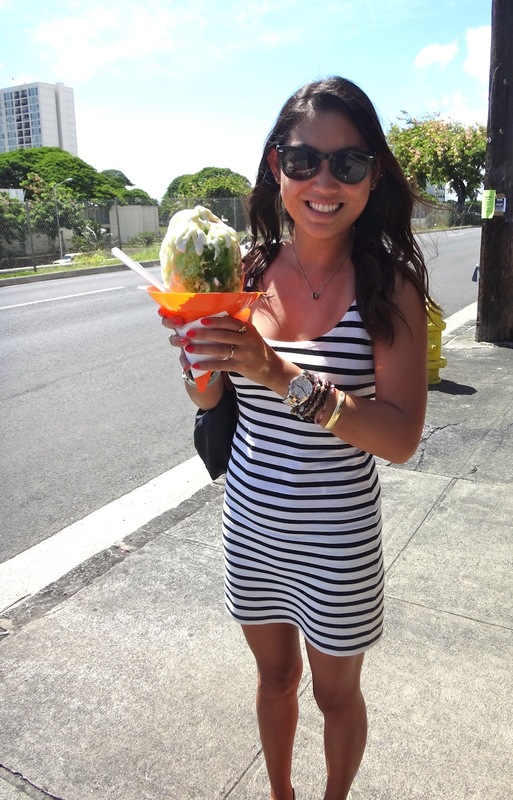 You don't know how long I've been wanting to try Shimazu's Shave Ice! Either it's been bad timing and I've just eaten, or they're closed when I want to go. Plus, it's a little out of the way and parking is practically non-existent. Well well well, life is all about timing. After Dim Sum one Sunday, we decided to get some dessert. It was the most perfect day. Around 230pm, and the sun was blazing. Mouth watering. Aside from all of the rules/signage, the shave ice is pretty amazing. Actually, I don't think the shave ice texture is any different from Waiola's, but the selection of toppings and add-ons are wondrous. Enter, Creamy Haupia topping for $1.25. Well worth it, I tell ya! Not to mention, the flavor options! Since no pictures are allowed, from what I can remember, there were delightful flavors like Red Velvet Creme, Creme Bruleé, Green Tea, Green River, Li Hing Pickled Mango, Strawberry Colada, Georgia Peach, Key Lime, and Mojito! So many to choose from, but only 3 flavors allowed per cone. I don't have pictures of the variety of sizes you can pick from, but believe me, some are larger than a child's head. Heck, larger than an adult head.....aka Extra-Large and called "The Larry." I don't know how these people finish it! A friend and I shared the Small and that was good enough for both of us! What flavors did we choose? Peaches N Cream, Li Hing Apple and Melona. Azuki Beans, Ice Cream and of course Creamy Haupia topping. Oh wait, and Condensed Milk, please!! Once you're inside, NO PICTURES OR VIDEO ALLOWED!! !